​Briseis was a female character who appeared in the tales of Greek mythology during the Trojan War. 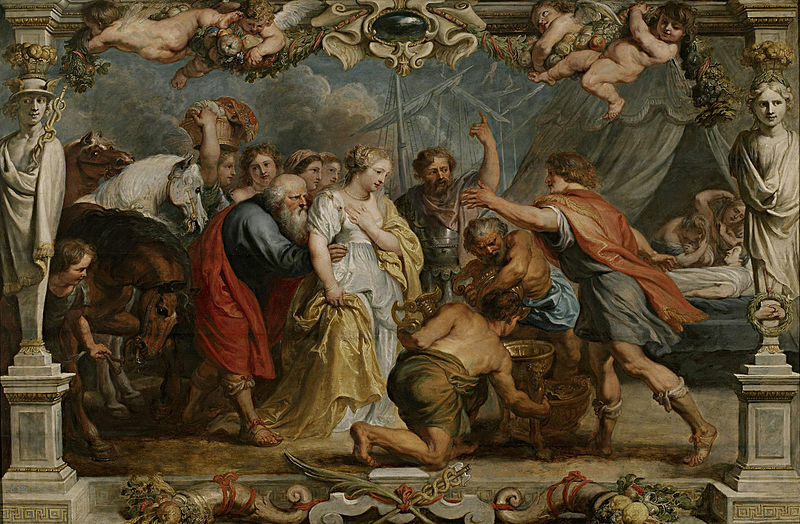 Briseis would become a concubine of the hero Achilles, but she was also the reason, through no fault of her own, why Achilles and Agamemnon argued, almost resulting in the Achaeans losing the war. Briseis would grow up to be extremely beautiful, the most beautiful maiden in Lyrnessus, with long golden hair and blue eyes, and it was perhaps only natural that Briseis would marry Mynes, son of Evenus, and King of Lyrnessus. The home of Brieseis, Lyrnessus was part of Dardania, and was joined in a relatively small region of the Troad, known by as Homer as Cilicia, by the towns of Cilician Thebes, home of Andromache, and Chryses, home of Chryseis; each town, and the women associated with it, playing a role in the story of the Trojan War. ​The town of Lyrnessus was allied to Troy during the Trojan War, and as a result was sacked by Achilles. During the taking of Lyrnessus, Achilles would kill King Mynes, as well as the three brothers of Briseis, and would take the beautiful Briseis as a war prize, Achilles planning on making Briseis his concubine. It was said that Briseus, when he learned that his daughter had been taken by the Achaean hero, committed suicide, hanging himself. Briseis had lost everything with the fall of Lyrnessus, but even as a war prize she would be well treated by Achilles, and his friend Patroclus. For Patroclus promised to Briseis, that Achilles intended to make her more than just a concubine after the war, proposing to make her his wife. The war did not look like ending any time soon, and so Briseis remained a concubine of Achilles, but she was well treated. ​Now, at a similar time, the city of Chryses (or Cilician Thebes) would fall to Agamemnon, and he too would take treasure and war prizes from the sacked city. One of Agamemnon’s war prizes was the beautiful Chryseis, daughter of the priest of Apollo Chryses. 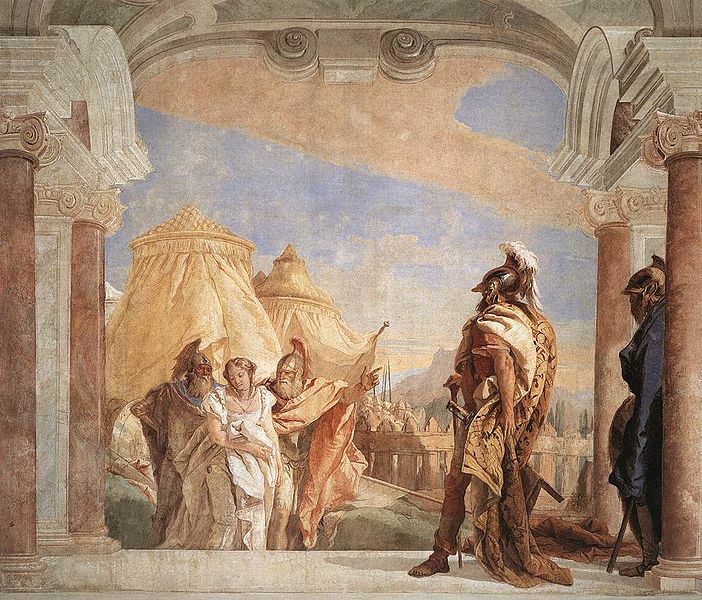 Chryses would seek to ransom his daughter from Agamemnon, but when Agamemnon refused, Apollo intervened on the behalf of his priest, and a plague spread through the Achaean camp. The seer Calchas now stated that Chryseis must be released. Agamemnon had lost his concubine, and now he sought a replacement, and believed that only Briseis was a suitable alternate. Agamemnon would threaten Achilles with force if Briseis was not given over to him, and whilst Achilles reluctantly agreed, he now compared Agamemnon to Paris, for the taking of Briseis was not so different to the taking of Helen, for which the whole Achaean army had come to Troy. Briseis had no option but to go to Agamemnon, but she was greatly upset at the prospect of leaving Achilles, but also upset that Achilles had not done more to keep her. Achilles, having given up Briseis, would withdraw himself and his army from the battlefield. The loss of the greatest of the Achaean warrior greatly depicted the strength of the Achaean force, and the Trojans were quick to take advantage. The Achaeans now faced defeat in the war. Agamemnon realised that they could not win without Achilles, and now offered to return Briseis to the son of Peleus, along with treasure taken from seven cities. ​Agamemnon even promised to Achilles that Briseis had not been touched the Mycenean king. ​Achilles did not immediately accept the return of Briseis, and continued to refuse to fight, although he did agree to allow Patroclus and his men to defend the Achaean ships. This though, proved deadly to Patroclus, for Patroclus adorned in the armour of Achilles, was killed by Hector. This death stirred Achilles to fight, and he now ended his feud with Agamemnon and accepted Briseis back. Briseis returned to Achilles’ tent but the first thing she now found was the body of Patroclus the friend of Achilles who had always been so kind to her. When Achilles finally agreed to the funeral of Patroclus, it was Briseis who helped to prepare the body. ​The death of Patroclus was soon followed though by that of Achilles, and now great grief was said to overcome Briseis. Again though, Briseis would prepare the body of Achilles for his funeral. Briseis all but disappeared from the tales of Greek mythology thereafter, and where she went is uncertain. Briseis is not mentioned as a concubine of Neoptolemus, Achilles’ son, although Andromache certainly is, and nor did she become a concubine of Agamemnon again, for Agamemnon returned home with Cassandra, perhaps therefore, Briseis became another, unnamed hero’s war prize, or perhaps she returned home to Lyrnessus.